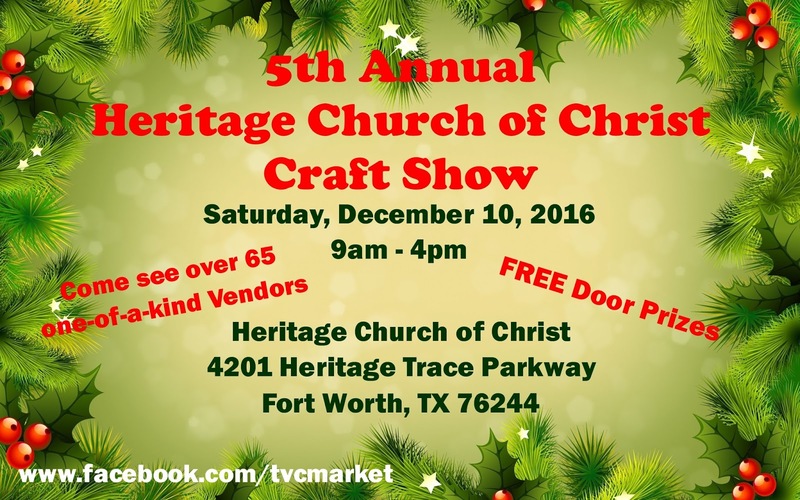 "Come finish your gift shopping at the 5th Annual Heritage Church of Christ Craft Show! You will find over 65 one-of-a-kind unique handcrafted and boutique vendors. Enjoy holiday music and sweet treats while helping to support local vendors. The event is FREE for shoppers with FREE DOOR PRIZES every 30 minutes. 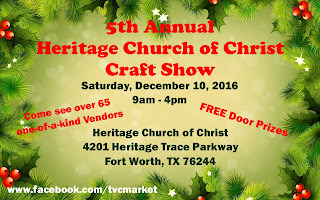 Vendor categories include bath & body, clothing & accessories, home décor, food, woodworking, metal décor, and gifts for children, adults and more." Booth size is approximately 9-10’ L to 8-10’ D in the main areas and 10’ L to 5’ D in the hallways. Applications are available here and are due by November 26, 2016.